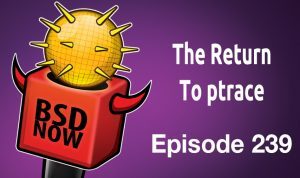 OpenBSD firewalling Windows 10, NetBSD’s return to ptrace, TCP Alternative Backoff, the BSD Poetic license, and AsiaBSDcon 2018 videos available. Whilst setting up one of my development laptops to port some software to Windows I noticed Windows 10 doing crazy things like installing or updating apps and games by default after initial setup. The one I noticed in particular was Candy Crush Soda Saga which for those who don’t know of it is some cheesy little puzzle game originally for consumer devices. I honestly did not want software like this near to a development machine. It has also been reported that Windows 10 now also updates core system software without notifying the user. Surely this destroys any vaguely deterministic behaviour, in my opinion making Windows 10 by default almost useless for development testbeds. Deciding instead to start from scratch but this time to set the inbuilt Windows Firewall to be very restrictive and only allow a few select programs to communicate. In this case all I really needed to be online was Firefox, Subversion and Putty. To my amusement (and astonishment) I found out that the Windows firewall could be modified to give access very easily by programs during installation (usually because this task needs to be done with admin privileges). It also seems that Windows store Apps can change the windows firewall settings at any point. One way to get around this issue could be to install a 3rd party firewall that most software will not have knowledge about and thus not attempt to break through. However the only decent firewall I have used was Sygate Pro which unfortunately is no longer supported by recent operating systems. The last supported versions was 2003, XP and 2000. In short, I avoid 3rd party firewalls. 1) First and foremost disable the Windows DHCP service – this is so no IP can be obtained on any interface. This effectively stops any communication with any network on the host system. This can be done by running services.msc with admin privileges and stopping and disabling the service called DHCP Client. 2) Install or enable your favorite virtualization software – I have tested this with both VirtualBox and Hyper-V. Note that on non-server versions of Windows, in order to get Hyper-V working, your processor also needs to support SLAT which is daft so to avoid faffing about, I recommend using VirtualBox to get round this seemingly arbitrary restriction. 3) Install OpenBSD on the VM – Note, if you decide to use Hyper-V, its hardware support isn’t 100% perfect to run OpenBSD and you will need to disable a couple of things in the kernel. At the initial boot prompt, run the following commands. 4) Add a host only virtual adapter to the VM – This is the one which we are going to connect through the VM with. Look at the IP that VirtualBox assigns this in network manager on the host machine. Mine was [b]192.168.56.1[/b]. Set up the adapter in the OpenBSD VM to have a static address on the same subnet. For example [b]192.168.56.2[/b]. If you are using Hyper-V and OpenBSD, make sure you add a “Legacy Interface” because no guest additions are available. Then set up a virtual switch which is host only. 5) Add a bridged adapter to the VM – then assign it to whichever interface you wanted to connect to the external network with. Note that if using Wireless, set the bridged adapters MAC address to the same as your physical device or the access point will reject it. This is not needed (or possible) on Hyper-V because the actual device is “shared” rather than bridged so the same MAC address is used. Again, if you use Hyper-V, then add another virtual switch and attach it to your chosen external interface. VMs in Hyper-V “share” an adapter within a virtual switch and there is the option to also disable the hosts ability to use this interface at the same time which is fine for an additional level of security if those pesky rogue apps and updaters can also enable / disable DHCP service one day which wouldn’t be too surprising. 6) Connect to your network in the host OS – In case of Wireless, select the correct network from the list and type in a password if needed. Windows will probably say “no internet available”, it also does not assign an IP address which is fine. We will use this service for a limited selection of “safe and trusted” programs to connect to the outside world from within the Windows 10 host. You can also use putty on the host to connect to the VM via SSH and create a SOCKS proxy which software like Firefox can also use to connect externally. Firefox – go to the connection settings and specify the VMs IP address for the proxy. Subversion – modify the %HOME%\AppData\Roaming\Subversion\servers file and change the HTTP proxy field to the VMs IP. This is important to communicate with GitHub via https:// (Yes, GitHub also supports Subversion). For svn:// addresses you can use Putty to port forward. --host-resolver-rules="MAP * 0.0.0.0 , EXCLUDE <VM IP>"
9) Congratulations, you are now done – Admittedly this process can be a bit fiddly to set up but it completely prevents Windows 10 from making a complete mess. This solution is probably also useful for those who like privacy or don’t like the idea of their software “phoning home”. Hope you find this useful and if you have any issues, please feel free to leave questions in the comments. I’ve managed to unbreak the LLDB debugger as much as possible with the current kernel and hit problems with ptrace(2) that are causing issues with further work on proper NetBSD support. Meanwhile, I’ve upstreamed all the planned NetBSD patches to sanitizers and helped other BSDs to gain better or initial support. I’ve fixed a crash in *NetBSD::Factory::Launch(), triggered on startup of the lldb-server application. a successful call to mprocessfactory.Launch(). that sets notifydelegates to false. I’m not counting hot fixes, as some changes were triggering build or test issues on !NetBSD hosts. Thankfully all these issues were addressed quickly. The final result is a reduction of local delta size of almost 1MB to less than 100KB (1205 lines of diff). The remaining patches are rescheduled for later, mostly because they depend on extra work with cross-OS tests and prior integration of sanitizers with the basesystem distribution. I didn’t want to put extra work here in the current state of affairs and, I’ve registered as a mentor for Google Summer of Code for the NetBSD Foundation and prepared Software Quality improvement tasks in order to outsource part of the labour. I’ve also improved documentation for some of the features of NetBSD, described in man-pages. These pieces of information were sometimes wrong or incomplete, and this makes covering the NetBSD system with features such as sanitizers harder as there is a mismatch between the actual code and the documented code. Some pieces of software also require better namespacing support, these days mostly for the POSIX standard. I’ve fixed few low-hanging fruits there and requested pullups to NetBSD-8(BETA). I’ve landed most of the submitted and reviewed code to the mainstream LLVM tree. Part of the code also verified the correctness of NetBSD routes in the existing porting efforts and showed new options for improvement. This is the reason why I’ve landed preliminary XRay/NetBSD code and added missing NetBSD bits to ToolChain::getOSLibName(). The latter produced setup issues with the prebuilt LLVM toolchain, as the directory name with compiler-rt goodies were located in a path like ./lib/clang/7.0.0/lib/netbsd8.99.12 with a varying OS version. This could stop working after upgrades, so I’ve simplified it to “netbsd”, similar to FreeBSD and Solaris. Remove one unused feature from ptrace(2), PTSETSIGMASK & PTGETSIGMASK. I’ve originally introduced these operations with criu/rr-like software in mind, but they are misusing or even abusing ptrace(2) and are not regular process debuggers. I plan to remove this operation from HEAD and backport this to NetBSD-8(BETA), before the release, so no compat will be required for this call. Future ports of criu/rr should involve dedicated kernel support for such requirements. Finish the backport of UCMACHINE_FP() to NetBSD-8. This will allow use of the same code in sanitizers in HEAD and NetBSD-8.0. When working on complex systems, such as OS kernels, your attention span and cognitive energy are too valuable to be wasted on inefficiencies pertaining to ancillary tasks. After experimenting with different environmental setups for kernel debugging, some of which were awkward and distracting from my main objectives, I have arrived to my current workflow, which is described here. This approach is mainly oriented towards security research and the study of kernel internals. My host system runs Linux. My target system is a QEMU guest. I’m tracing and debugging on my host system by attaching GDB (with NetBSD x86-64 ABI support) to QEMU’s built-in GDB server. I work with NetBSD-current. All sources are built on my host system with the cross-compilation toolchain produced by build.sh. I use NFS to share the source tree and the build artifacts between the target and the host. I find IDEs awkward, so for codebase navigation I mainly rely on vim, tmux and ctags. For non-intrusive instrumentation, such as figuring out control flow, I’m using dtrace. -r Remove contents of TOOLDIR and DESTDIR before building. -u Set MKUPDATE=yes; do not run "make clean" first. Without this, everything is rebuilt, including the tools. On my desktop, running a quad-core Intel i5-3470 at 3.20GHz with 24GB of RAM and underlying directory structure residing on a SSD drive, the entire process took about 55 minutes. I was running make with -j12, so the machine was quite busy. On an old Dell D630 laptop, running Intel Core 2 Duo T7500 at 2.20GHz with 4GB of RAM and a slow hard drive (5400RPM), the process took approximatelly 2.5 hours. I was running make with -j4. Based on the temperature alerts and CPU clock throttling messages, it was quite a struggle. ECN (ABE)” proposal to the New Reno congestion control algorithm module. ECN-signalled congestion relative to the loss-inferred congestion response. enable ABE for ECN-enabled TCP connections. signal respectively. They default to the values specified in the draft i.e. experimentation as a result of some discussion at IETF 100 in Singapore. The recent changes in -current mitigating the Meltdown vulnerability have been backported to the 6.1 and 6.2 (amd64) releases, and the syspatch update (for 6.2) is now available. Implement a workaround against the Meltdown flaw in Intel CPUs. The following changes have been backported from OpenBSD -current. features are not yet used. come later; it needs some machdep.c cleanup first. Meltdown: implement user/kernel page table separation. kernel stack, then copies over the necessary bits from the trampoline stack. trampoline stack, switch stack, switch page tables, and return to userspace. issues on MP in particular, and drove the final push to completion. Per-CPU page layout mostly inspired by DragonFlyBSD. The compile time assertion for cpu info did not work with gcc. Rephrase the condition in a way that both gcc and clang accept it. between the u-k and u+k tables, because they’re actually in all tables. Once in Dunedin the hacking commenced. The background was a regular tick of new meltdown diffs to test in addition to whatever work one was actually engaged in. I was lucky (?) in that none of the problems with the various versions cropped up on my laptop. I worked with rpe@ and tb@ to make the install script create the ‘correct’ FQDN when dhclient was involved. I worked with tb@ on some code cleanup in various bits of the base. dhclient(8) got some nice cleanup, further pruning/improving log messages in particular. In addition the oddball -q option was flipped into the more normal -v. I.e. be quiet by default and verbose on request. More substantially the use of recorded leases was made less intrusive by avoiding continual reconfiguration of the interface with the same information. The ‘request’, ‘require’ and ‘ignore’ dhclient.conf(5) statement were changed so they are cumulative, making it easier to build longer lists of affected options. I tweaked softraid(4) to remove a handrolled version of duid_format(). I sprinkled a couple of M_WAITOK into amd64 and i386 mpbios to document that there is really no need to check for NULL being returned from some malloc() calls. I continued to help test the new filesystem quiescing logic that deraadt@ committed during the hackathon. I only locked myself out of my room once! Fueled by the excellent coffee from local institutions The Good Earth Cafe and The Good Oil Cafe, and the excellent hacking facilities and accommodations at the University of Otago it was another enjoyable and productive hackathon south of the equator. And I even saw penguins.